Indigenous wisdom traditions provide the world with diverse perspectives and practices based on respect, reciprocity and balance. 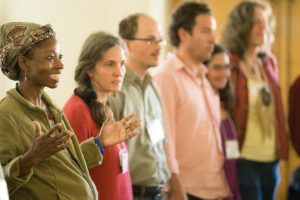 As we increasingly feel the limitations of global systems that jeopardize our Earth, Sacred Fire Foundation encourages multi-generational gatherings centered on ancestral wisdom for social change. Here, we invite you to rise with us to experience the world as living, aware and sacred. The next Ancient Wisdom Rising, Sacred Fire Foundation’s premier event, is being restructured. Check back here for more information soon. Sign up to receive updates on Ancient Wisdom Rising, Voices of Wisdom, and our other work in the world. We are delighted to introduce our new Executive Director, and to report that our grant cycle had the largest response in its history. In addition, our next Voices of Wisdom event and the Wisdom Fellowship Award Ceremony are both coming up soon.